Best Places for Stargazing and Meteor Showers in India. About this post: After years of chasing dark night skies for stargazing in India, I’ve put together this post with my favorite places to spot shooting stars and catch meteor showers in India – along with recommendations from an Indian astrophotographer. Whether you’re looking to catch the Geminid Meteor Shower in India, sleep under the Milky Way, witness the Perseid Meteor Shower in India or just spots shooting stars, this India stargazing guide will help you find the best spots! If you’ve ever spent a clear, dark night lying under the (real) night sky, watching millions of stars twinkling above and spotting shooting stars, you’ll probably share my horror at what Japan is about to do. I mean, half the joy of stargazing is travelling to a place away from everything – pollution, lights, clouds, noise and city life as we know it – and feeling your insignificance under a shimmering sky. Personally, I think that anyone who has admired the Milky Way in the night sky recognises the need to go off the grid once in a while, protect nature and dark spaces, and shun our materialistic greed. 3 musketeers and an incredible night sky in Pachmarhi. On a dark, lonely night in Pachmarhi – Madhya Pradesh’s only “hill station” – I found myself under an incredible night sky with a naturalist from Forsyth Lodge and a local guide from Pachmarhi. The three of us, lost souls in our own ways, stood there watching the crescent moon set behind the hills, deciphering constellations and hearing rustling in the bushes – this is tiger territory after all! Oh India, under a sky full of stars, your inner darkness is fascinating too! Stay: Club a trip to Pachmarhi with a visit to Satpura National Park, where I loved staying at the eco-friendly Forsyth Lodge – home to gorgeous dark night skies as well. Experience Pachmarhi with one of their naturalists and preferred guide from Pachmarhi for an immersive wildlife and stargazing experience. Note that budget accommodation in Pachmarhi is very basic. Getting there: The closest airport is Nagpur, from where Satpura National Park is a 3-4 hour drive. Pachmarhi is a 2-3 hour drive from Forsyth Lodge. When to go: Winter months from October to March when the weather is cooler and the skies clearer. Pachmarhi is at a height, so carry some warm clothes. In an attempt to catch the Geminid Meteor Shower in 2016, I landed up in the Little Rann of Kutch, fingers crossed for clear and dark skies, devoid of light or air pollution. Unlike the Great Rann of Kutch with the white salt desert, the Little Rann sees few visitors, and I was glad to be one of the only people staying in a kooba (round thatched roof hut) opposite the cracked earth desert. When night fell, I lay in absolute darkness and silence, my eyes slowly adjusting to the night sky. Bright stars appeared above me one by one, shooting stars dashed through the sky and big green mesmerising Geminid meteors stole the show! Stay: Stay at Devjibhai Ka Kooba opposite the Little Rann of Kutch desert. There are no other accommodations in the vicinity, so it gets pretty dark at night. Devjibhai’s son is well acquainted with these parts and has some ideas for really dark spots for intrepid stargazers – inform them in advance about your interest in stargazing. Getting there: The Little Rann of Kutch is a 6-7 hour bus ride from Ahmedabad. When to go: Winter months from November to February see cool temperatures and clear skies. Carry a light jacket for chilly nights. Star trails in Andaman and Nicobar. Photo: Saurabh Narang. The Andaman & Nicobar Islands offer much more than dreamy beaches; thanks to their remote location and little light pollution, the night skies are stupendous for both stargazing and creating astro time-lapse videos. Lay on the unobstructed helipad on Havelock Island, on a tropical night, for thousands of stars in your eyes and the waves of the Indian Ocean in your ears. Or go further off the beaten track to Mayabunder, to live with a tribal Karen family, so far away from city lights that as the sky above fills with twinkling stars, you’d begin to wonder if the former really exist. Getting there: Take the 2-hour ferry from Port Blair (the capital) to Havelock Island, or a bus from Port Blair to Mayabunder. When to go: November to January is best for clear skies. Stars above my hut in Goat Village. Living without electricity in different parts of Garhwal totally made me question why we need it at all. Days are meant to be spent outdoors and nights under dark shimmering skies. As I lay under thousands of stars, I couldn’t help but think back to my childhood days in Dehradun, when during long powercuts at night, we would sleep out in the garden, in the breeze and under the stars! These days, nights in most Indian households are for television, internet and air conditioning. Perhaps it’s time to reconsider what “development” really is. Stay: The Goat Villages, set up with a goal to encourage the reverse migration of Himalayan farmers, are experiences unto themselves – the fact that they don’t have electricity means that you can see incredibly dark skies right from your balcony! Getting there: The Goat Villages near Nag Tibba and Uttarkashi are 3 and 7 hours from Dehradun respectively, accessible by shared taxi. When to go: The skies are clear year-round except the monsoon months from July to early September. Imagine if you can. The Perseid Meteor Shower is going to peak and I make a mad dash with my partner to seek clear skies in Rajasthan’s Thar Desert. We reach Churu close to midnight, and drive out to the farm of our host family where they’ve laid out khatiyas for us to sleep on. Although there is more light pollution here than the further reaches of the Thar, we spot 5 Perseid meteors in literally the first 15 minutes – bluish, more sluggish, closer to earth than shooting stars. Then the moon rises higher and fills the sky with light and the cool breeze puts me into a deep slumber. Sleeping outside is so underrated! Further out in the Thar Desert, accessible via Jaisalmer, I caught my first Gemenid Meteor Shower, laying on a flimsy mattress on the leeward side of a sand dune with a bottle of rum to keep warm! There’s no joy like seeing the Milky Way in the vast expanse of a desert sky, as large green meteors streak through the sky. Stay: Malji Ka Kamra was the base of our meteor shower adventures in Churu – clubbed with discovering crumbling old havelis that have stood the test of time. In Jaisalmer, l loved exploring the Thar Desert and stargazing with Suryagarh. Getting there: Churu is a 5-6 hour drive from Delhi, while Jaisalmer is a long overnight train ride away. When to go: The winter months from November to February are best for clear skies and relatively cooler desert weather. Nights get chilly in winter, so carry warm clothes. The Milky Way from my abode in Pin Valley. Although all of Spiti is heavenly for stargazers and astrophotographers, I felt like there was a different kind of magic to stargazing amid the stark mountains, gushing rivers and all-encompassing silence of Pin Valley. On each of the two nights I spent there, I would finish dinner with my host family and slip out onto the terrace, as gazillions of stars lit up the skies above and the Milky Way (the part of our galaxy we can see in the sky) shone like an ethereal apparition in the darkness. I was fully aware of sharing this territory with snow leopards somewhere in the mountains above and red fox somewhere in the valley below – and even jumped at a glowing pair of eyes in the far distance once! Stay: The Hermitage, designed by French volunteers, run as a guesthouse by a local family and supported by social enterprise Spiti Ecosphere, is tucked away deep in the heart of Pin Valley. A heartwarming experience with crystal clear night skies. Getting there: Pin Valley is a 2-3 hour drive from Kaza, the administrative capital of Spiti – which is a 14-hour drive up on treacherous roads from Manali. When to go: Pin Valley is most accessible in the summer months from late May to early October; the night skies are always clear (and hope they’ll remain so despite growing tourism). Starry skies amid the clouds in Meghalaya. Photo: Saurabh Narang. Meghalaya, home to the wettest place on earth, is seldom associated with stargazing. But besides cloudy skies, the lush green countryside often opens up to moments of pure silence with clear dark skies above, full of stars! In the small hill village of Shnongpdeng, close to the Bangladesh border, on a new moon night, find an isolated spot, let your eyes adjust to the darkness and watch the canvas above fill with twinkling lights – a most magical experience. Getting there: Fly to Guwahati, from where Shillong is 2.5 hours and Shnongpdeng further 3-4 hours drive. When to go: The best time for stargazing and clear, cloudless skies is mid December to mid January. A charpoi under the stars, in Punjab. I unexpectedly landed up in Punjab, thanks to a cheap flight from Singapore to India – not knowing that I’d be rewarded with a stellar night sky. The rural countryside of Gurdaspur district, especially the village of Gunopur, home to mustard fields and (mostly) friendly farmers, offers chilly winter nights with little light and air pollution, which meant I could lay out on a charpoi on my terrace and gaze into the twinkling infinity. The sky clarity here doesn’t compare to that of Gujarat or Ladakh and you can’t see the Milky Way, but it’s a fulfilling experience nonetheless. Stay: I loved staying at Punjabiyat, sandwiched between the villages of Saidowal and Gunopur, in the Gurdaspur District. Getting there: The nearest airport and train station are in Amritsar, only over an hour away. When to go: The winter months from November to February are best for clear skies and blooming mustard fields. The Milky Way amid the ugly construction of Bomdilla. Photo: Saurabh Narang. 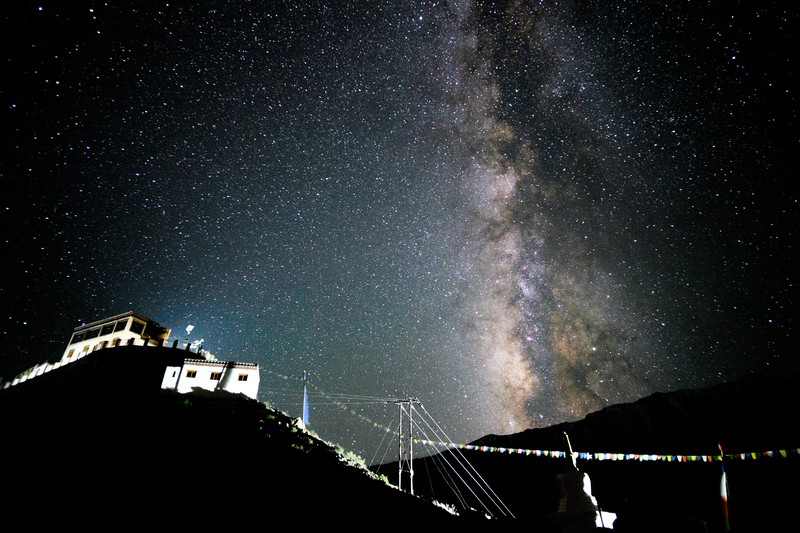 Sparse inhabitation and low light pollution account for incredible night skies across Arunachal Pradesh in northeast India, but the best places to embrace the cold and take in the stars are the tiny town of Bomdilla and the famous seventeenth century Tawang Monastery. By day, explore the intriguing tribal culture and hike amid the stellar beauty of the eastern Himalayas; by night, bundle up in warm clothes and gaze up at the Milky Way, surrounded by millions of stars – worth losing sleep over! Getting there: Take the bus from Guwahati to Bomdila, followed by a shared taxi. The long and treacherous journey is well worth it. When to go: March to October are best for clear skies and warmer weather. The stellar cold mountain desert night sky. Like Spiti, all of Ladakh is incredible for stargazing – although unlike Spiti, it is also thronged by mindless tourists who think it’s okay to play loud music at night at the serene Pangong Lake. The bane of every stargazer. Stay: Opt for a homestay with traditional Ladakhi facilities. I’ve heard that Ladakhi Women’s Travel Company is great at helping finding those. Getting there: The easiest way to get to Ladakh is flying in to Leh. Set aside a few days to acclimatise to the high altitude. When to go: The summer months from May to August are the warmest, though also pretty busy. The real night sky – better than anything technology could create! On the last night of a heartwarming journey through Odisha, I sat outdoors, all by myself. The air smelt aromatic, sounds of a “kidnap wedding” broke the silence (that story is for another day), the silhouette of tiny mangoes on an ancient tree kept me company. Then a power cut plunged the world around me into darkness, and as silence washed over all my senses, tons of tiny stars dotted the skies above. A befitting end to an journey that I hope to continue one of these days. Stay: I saw some magical skies at Chandoori Sai, the home (and homestay) of an Australian guy who made a small village in Koraput his home some 13 years ago; it’s also the most luxurious yet eco-friendly place to stay in the region. Getting there: The nearest train station is Koraput. When to go: The winter months from November to February are best for clear skies and cooler temperatures. Have you spotted shooting stars or caught a meteor shower in India? What are your favorite spots? Join me on Instagram, Twitter and Facebook for more offbeat travel ideas. Ladakh is amazing for stargazing, but it was pretty cloudy and way too cold to venture out at night when we went in May 2016. Am going to the Andamans in December and will keep an eye out for that helipad at Havelock. Thanks for another great post, Shiva. Hope you have better luck in Havelock! I haven’t been there yet but I can imagine foggy weather must be beautiful too! Hey Shivya! I plan to venture out on my first solo trip on a very tight budget. How do I find people to host my stays? I want to have a very authentic experience and be careful about the safety. Any suggestions? I love homestays for that reason – affordable, authentic and safe. Make sure you read lots of reviews. Depending on where you’re going, there are lots of suggestions on my blog (see My travels > India). Also see IndiaUntravelled.com for ideas. I haven’t star gazed ever. This post inspires me to do that as the first thing once I get back to India. Thanks for sharing. Stay blessed. I love this yet you made me miss living in Bali. Whenever the power went out, often, you’d be treated to a spectacular night sky full of stars. Would certainly incorporate some star gazing into a trip to India. Never quite associated Bali with stargazing but I can now imagine the vast skies over the rice paddies full of stars! Got your point… Well written article……Thanks for sharing……..
Nice work keep moving on…. Wonderful one!! You amaze us in various ways with unique perception!! May not be meteroid showers but i believe rameshwaram/kanyakumari is another place where it is great for stargaze… but tourists are more due to its history!! I was born in Tawang and spent my teens in Bomdilla . At night I had ‘ seen it to believe it’ that we are actually a part of the milky way. Now I live in a city and spot few twinkles and try to verify if it’s a plane or a star. Your post got me nostalgic. Hello, It’s very really great information for becoming a better Blog.You become a idol for me.You always change my the Way of thinking.Your way thinking is Really amazing. Nice Blog Post, I like the most “Ladakh – Jammu and Kashmir”, weather of that side is very good. I would really love to travel like you to different places. Nice Article full of informative content. The most beautiful place in Gujarat is “Little Rann of Kutch”. We studied about it into books. But through your article I realize it’s so beautiful. Have been to Pin Valley last year. Just amazed by the beautiful, serene, and colorful landscapes. What a nice place with a thousand stars ! Bari village, the base camp for Mount Kalsubai ( the highest peak of maharMahara) or Kalsubai peak itself (if you go for an kverovern trek) it offers an exceptional vovi for thousands of stars. I am pretty sure that can also be a place for metror shower. If you can reach the peak you get an amazing sunrise too! I want to know the place in or near kolkata from where I can watch meteor shower clearly? Nice post shivya. I am in bangalore and by any chance any place nearby I can view this beauty from? Previous PostWhat It’s Like to Travel Solo When You’re in a Relationship. Next PostIf I Were a Season, I’d be Monsoon.